Dr. Cunha has served in the School of Theology since 2011. He grew up in São Paulo, Brasil, where he served as a minister of the Presbyterian Church of Brasil (IPB). 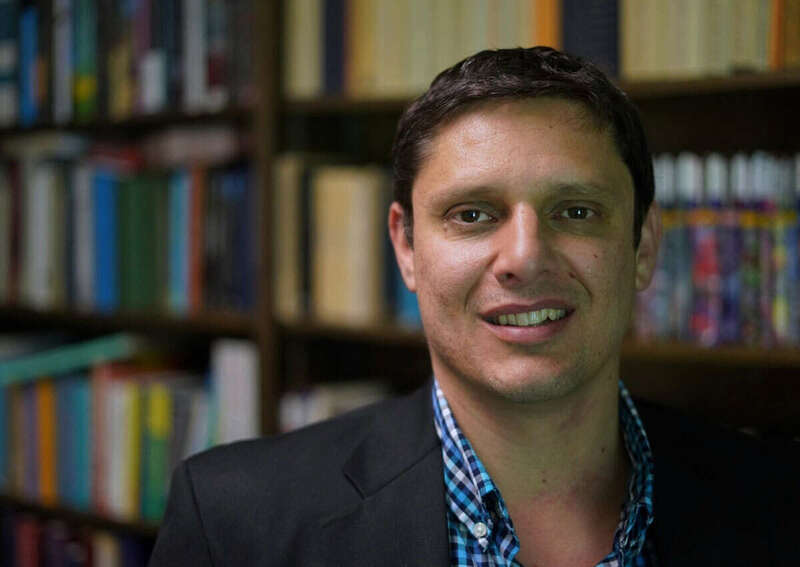 After completing his Bachelor of Theology degree, Dr. Cunha pursued a Th.M. in Old Testament studies at Calvin Theological Seminary, in Grand Rapids, MI. There, he met his wife, Katie, where they married before leaving for his Ph.D. at Leiden University, in the Netherlands. They have three children: Matthew, Isabella and Chloe. Among Dr. Cunha’s hobbies are playing fantasy football, reading on history, theology, history of philosophy, and politics, being active in the life of his children, playing board games and entertaining friends, and dreaming of building a pizza brick oven next to his barbecue brick fire pit in his backyard. 2019 Cunha, Wilson de Angelo and Christian Brially de Medeiros. Post tenebras lux: A Reforma Protestante e seu alcance no Brasil. Uma Festschrift para o Rev. Hermisten Maia Pereira da Costa (Brasília: Monergismo, forthcoming). 2019 Cunha, Wilson de Angelo. The Book of Isaiah: A Thematic Approach (Pickwick Publications; forthcoming). 2019 Cunha, Wilson de Angelo. “Fé, Ciência e Acomodação Divina em João Calvino” in Wilson de Angelo Cunha and Christian Brially de Medeiros, Post tenebras lux: A Reforma Protestante e seu alcance no Brasil. Uma Festschrift para o Rev. Hermisten Maia Pereira da Costa (Brasília: Monergismo, forthcoming). 2013 Cunha, Wilson de Angelo. “‘Kingship’ and ‘Kingdom:’ A Discussion of Isaiah 24:21-2; 27:12-13” in Formation and Intertextuality in Isaiah 24-27 (ed. Todd Hibbard and Paul Kim; Ancient Israel and Its Literature 17; Atlanta: SBL, 2013), 61-76. 2013 Cunha, Wilson de Angelo. “LXX Isaiah 25:6-8 and the Issue of Coherence” in LXX: XIV Congress of the International Organization for Septuagint and Cognate Studies, Helsinki 2010 (ed. Melvin K. H. Peters; Society of Biblical Literature Septuagint and Cognate Studies 59; Atlanta: SBL, 2013), 277-290. 2009 Cunha, Wilson de Angelo. “A Brief Discussion of MT Isaiah 24,14-16,” Biblica 90 (2009), 530-544. 2018 Cunha, Wilson de Angelo. Review of Ben Witherington III, Isaiah Old and New: Exegesis, Intertextuality, and Hermeneutics (Minneapolis: Fortress Press, 2017). Review of Biblical Literature 07/2018. 2016 Cunha, Wilson de Angelo. Review of William D. Barker, Isaiah’s Kingship Polemic (FAT 2/70; Tübingen: Mohr Siebeck, 2014). Bibliotheca Orientalis LXXIII/1-2 (Jan/April 2016): 197-201. 2013 Cunha, Wilson de Angelo. Review of Arie C. Leder. Waiting for the Land: The Story Line of the Pentateuch (Phillipsburg: P&R Publishing, 2010). Calvin Theological Journal 48/2 (2013): 332-335. 2013 Cunha, Wilson de Angelo. Review of J. Stromberg. An Introduction to the Study of Isaiah (London: T & T Clark, 2011). Journal of the Evangelical Theological Society 56/3 (2013): 605-607. 2013 Cunha, Wilson de Angelo. Review of J. Ferry. Isaïe: “Comme les mots d'un livre scellé...” (Paris: Cerf, 2008). Review of Biblical Literature (2013) (http://www.bookreviews.org/pdf/6571_7115.pdf). 2017 John Calvin on the Christian Life. Reformation 500 Conference at LeTourneau University. 2015 “Eusebius of Caesarea and the “Drink of Immortality:” The Reception of LXX Isaiah 25 in Eusebius’ Commentary on Isaiah.” SBL Annual Meeting in Atlanta. Group: Greek Bible. 2015 “The naḥaš in the Garden of Eden (Gen 2:4b-3:24): Malevolent or Benevolent?” SBL Annual Meeting in Atlanta. Group: Genesis. 2014 “Genesis and the Age of the Earth.” Round table debate on the Bill Nye and Ken Ham Origins Debate. LeTourneau University. 2013 “The Foreigner in the Old Testament and Christian Identity.” Keynote speaker at the Students Scholars Conference at LeTourneau University. 2013 “God’s Creation of Adam from “Clay/Soil” (עפר): Does Genesis 2:7 Point to a Particular Model of Creation?” A Dialogue with Dr. Gordon Johnston by occasion of the Theological Symposium at LeTourneau University. 2012 “Between Etiology and Theology: A Discussion of the Garden in Eden Story (Gen 2:4-3:24).” Lecture delivered at the Sciences Seminar at LeTourneau University. 2011 “On Isaiah 27:1, 2-13.” SBL Annual Meeting in San Francisco. Group: Formation of Isaiah. 2010 “LXX Isaiah 25:6-8 and the Issue of Coherence.” The International Organization for Septuagint and Cognate Studies. Helsinki, Finland. 2009 “The Reception of Isaiah 24:14-16 in LXX Isaiah.” SBL Annual Meeting in New Orleans. Group: Formation of Isaiah. 2009 “The Reception of LXX Isaiah 25 in Eusebius of Caesarea’s Commentary on Isaiah.” Von der Septuaginta zum Neuen Testament. Textgeschichtliche Erörterungen, Wuppertal, Germany.